Step into a dream machine and travel through your husband's mind to reveal the truth of what really transpired on the evening that left him comatose and your children missing. It's a whole new world inside his head—a world not as bright and joyful as the one on the outside—and in the face of tragedy, you must navigate the darkness to unravel the events of that fateful night. Become entranced by this immersive story as you solve challenging puzzles, find scattered clues, and reclaim your kidnapped children. 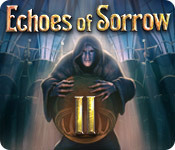 Echoes of Sorrow II is rated 3.4 out of 5 by 31. Rated 5 out of 5 by tutortime from Great little game. Very enjoyable game. Nothing spectacular, but a solid good game. Storyline was interesting and graphics good. It plays quickly. Great game for your free coupon. Rated 5 out of 5 by FionaPa from Terrific game, lovely gameplay Some games get it just right. Puzzles of just the right difficulty, not too many cutscenes, original and engaging storyline. This game was a pleasure from start to finish. Rated 5 out of 5 by denniann2 from a really interesting game that i really liked this game is kind of hard. the hints charge kind of slowly. i played casual, low sound. there is a diary but no map which i could have used since there was a good bit of back and forth. you are looking for your kids after your ex-husband has kidnapped them. before that though, your were married to their father and he was charged with you father's death so your ex went to jail, you then married his best friend who was there to help with the kids after your ex-husband went to jail. your now husband winds up shot and you are sure your ex did it and left the notes about your kids being taken. then you decide to go into his brain to find your kids with a dream machine. well you find out the truth about all of it. some of the HO scenes are pretty dark and the items are hard to find, but it is a game that makes you think and it has good length, so it isn't a game that you waste money on because of length. sequel.....this is one so why not. Rated 5 out of 5 by rosekaufmann from INTRIGUING ALL IS NOT AS IT SEEMS GENERAL: Don't understand the low reviews. Played casual which was quite easy but still a lot of fun. The comments and glints lead you to the next action in most cases. I wanted to try the more difficult mode, but apparently you can't change difficulty midstream and I didn't want to start over. But I will buy and then try to more difficult level. THE GAME: Graphics are crisp and clear. Story is intriguing and suspenseful. Can't wait to see how it ends to see if my suspicion about the new husband is correct. You know what your tasks will be. Items found are used within a short distance of finding them. HOS are nicely done - not too difficult to find as the objects are well-defined and not tiny. Puzzles are not too difficult to solve. Music is pleasant. Polished gameplay. Good recreational game. TIP: If you don't like to be "lead," try the more difficult mode. Note it does not appear you can change the difficulty level after starting the game. Rated 5 out of 5 by LobsterMann from I liked this game...ALOT I don't understand all the poor reviews for this game...honestly. I found it fun and absorbing. I loved the minigames they were good and made sense within the storyline. I did not understand why suddenly we were in the hospital, I think some explanation should have been given...and to be honest that was the only flaw I saw. The sparkles did not bother me...at all. Rated 5 out of 5 by tobysue09 from Really enjoyed this game! I got this game as a freebie and was surprised at how much I enjoyed it. I'll admit, it's not the best game I've ever played, but I really liked the storyline and the visuals were nice also. Not disappointed in the least and would highly recommend this game. 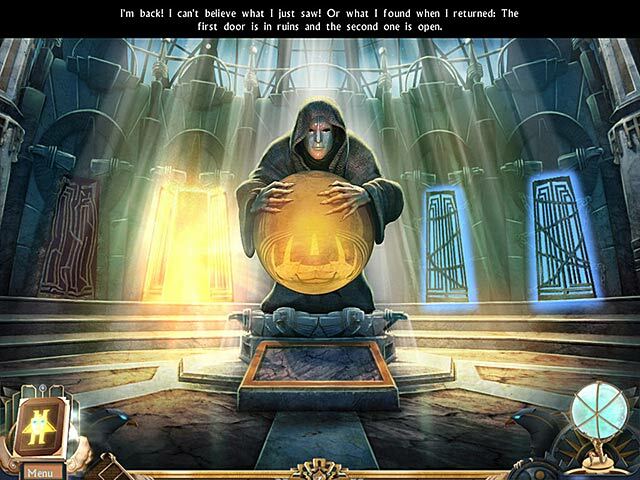 Rated 5 out of 5 by BlackWaterRules from Dark Hidden Object Adventure Game Based on the Demo I enjoyed the graphics: glitzy, like a high gloss magazine. They were clear, crisp, and clean. The soundtrack was excellent, piano music that turned into orchestral music. It was beautifully done and appropriate for this game. Voiceovers were well done. There was an eerie and spooky quality to some of the soundtrack. The storyline was great. There is a powerplay between the heroine's husband and father. Her father ends up dead. Husband goes to prison for ten years. There is another man waiting in the wings for her. She marries him. Now, ten years later, husband number one is released from prison. High drama and terror ensue. 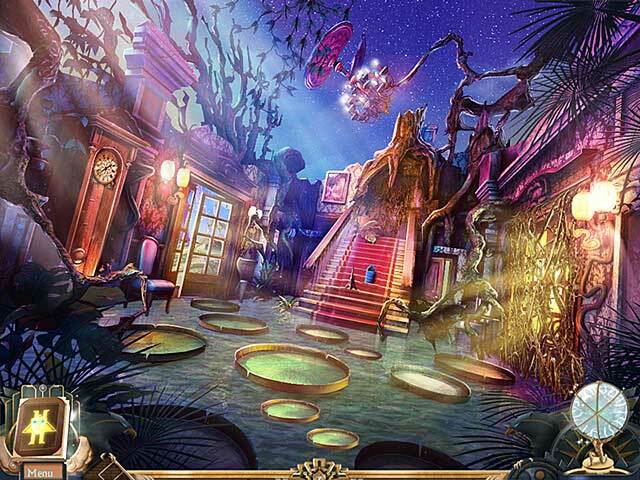 The hidden object scenes are well done. There is no interactivity, just straight point and click on the objects in the list. The mini puzzles were a lot of fun. There is no reset button but there is a skip button. There is a journal that I never used. It just repeats the story. There are no collectibles or achievements but you collect photo pieces, marbles, tiles, and pieces of sheet music to use in the mini games. This is a great game. Rated 5 out of 5 by pennmom36 from Who Offed Daddy? I was really surprised by the simplicity of this game, it just goes to show you that you don't have to have players jump through hoops to make the game enjoyable. There are only two modes of difficulty and the casual setting will have so many glints that you'll want to wear sunglasses. This is a love triangle, murder whodunit and the devs have done a nice job with the suspense factor, hopefully all the way to the end of the game. 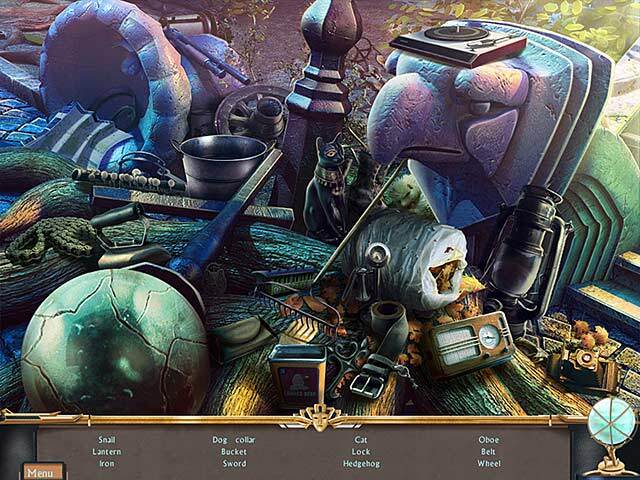 There are just the right amount of hidden object scenes and they are just simple list finds. The mini games are easy, some a little time consuming such as placing colored marbles in the correct color coded pie shaped grid by turning one disc at a time and placing a marble in the free spot in order to shift the marbles to inner and outer rings. This game isn't going to woo you with collectibles and morphs and your not going to win an eagle eye achievement, but you will get to find out whodunit! Rated 4 out of 5 by LunaNik from 3½ stars...good story and gameplay Echoes of Sorrow II Review based on completed game PREFACE… This game hearkens back to a simpler era of HOPAs. There are no flashy cinematics, technicolor graphics, or realistic posers. It's more like a graphic novel turned HOPA. And while it is a touch dated, the story is good and gameplay is immersive. I'm guessing that the initial game in this series was never ported to the Mac, as it doesn't show up in a search. ONCE UPON A TIME... You play as Sarah, one corner of a convoluted love triangle. The other two corners are Lucas—your ex-husband, now in prison for the murder of your father—and John—your current husband, your father's former business partner, and the Mayor. Fast forward ten years, and Lucas is out of jail. You arrive home to find your children missing and track him down, only to find John with a gunshot wound and Lucas with the gun in hand. Lucas pleads with you to hear him out, to know the truth. At the hospital, a former neurosurgeon offers you a way to find out...by using a machine he developed to enter John's thoughts. Will you find out that John is an innocent victim and Lucas a desperate criminal? Or have you been deceived by John all along? PLAY THE GAME... HOPAs are all straight up list...no interactions. I did find a couple spots where items on the list were completely behind other objects, to the extent that they couldn't be seen. Call it a technical difficulty, and it only happened twice, and only in one scene. The cleverness here was in hiding objects in plain sight, as it were. Adventure mode is absolutely full of things to do: finding parts of things, collecting like items, gathering tools and fixing machinery, looking for keys, etc. What was missing was utterly refreshing: I didn't have to find a million shaped medallions, bas reliefs, and so on to fit into matching shaped indentations. Puzzles were far too simple and all retreads. And there were way too many jigsaw puzzles with square pieces where you had to either slide the pieces or rotate them. Way too many! SIGHTSEEING… The graphics and animation were fairly old school. Some of the HO scenes appeared a bit cut-and-paste. There wasn't a lot of animation, and it was rather stuttering. The cutscenes were presented in more of a graphic novel format. SOUND WAVES… The music fit the storyline well, evoking mystery with piano melodies in a minor key. Game sounds were not that great, and atmospheric sounds could have been better. Voiceovers were done extremely well. TOOLBOX… I didn't see a map, though there is a journal that notes clues you find. Other than that, there were no special tools or helpers. THE LAST WORD… While this wasn't a difficult game, there was a lot to do, and the story was presented well, although I think our heroine was rather naive. I'd recommend it with a PCC, which is how I acquired it. Rated 4 out of 5 by tehuti88 from Echoes Of Sorrow II This game is the sequel to "Echoes Of Sorrow," which I've previously reviewed. Although I've given it the same rating, IMO the sequel isn't quite as good as the original, unfortunately. :/ While the artwork pretty much holds up to the original game (again, the cutscene animations are rather cheesy), and the game as a standalone is pretty decent, the fact that the game isn't really a "sequel" or continuation so much as it is merely another, different story in a series was rather a disappointment; while the story in the original game was complete in itself and had a proper ending, there was so much potential to carry on the plot into a second game, and that was rather what I'd been expecting when I read the summary for "Echoes Of Sorrow II." Alas, as I said, it's an entirely different story with different characters, though the basic theme and gameplay are about the same. Plot: I must admit, it was a bit convoluted for me to follow after just one play, and my memory is iffy, but this is the gist of it. In this game, you are no longer Rose, but another woman named Sarah (I think). Your ex-husband, Lucas (I think?) --a journalist--was imprisoned after allegedly murdering your father and now has apparently shot your current husband, John, the mayor (I think!). However, not all the facts in the story are holding up, and when your kids go missing--has Lucas kidnapped them as revenge?--you go seeking answers behind everyone's shady behavior. In a weird plot point, you gain access to your hospitalized husband's thoughts via a special technology; and here is where gameplay starts to strongly resemble that of the original "Echoes Of Sorrow," as you find yourself in John's mind. Again there is a mysterious statue, this time surrounded by four doors, which lead you to a construction site (I believe), a prison, Lucas's house (again, I believe) and John's mansion/your home (one more "I believe"). Similar to the original game, you have to work your way through each location to solve another part of the mystery, though in this game there's no equivalent of exorcising the ghosts of the past, you're merely seeking facts. After completing the quest in John's mansion, you have to find your way to a boat to rescue your kids, the equivalent of the final showdown scene in the original game. I didn't keep track of how long it took to play, though it seemed about average. You first explore your home and the hospital before making your way to the four primary game locations, then afterward to the boat, again running parallel to the first game. I'm a bit embarrassed to admit I had to use hints a few times on hidden-object scenes, though the scenes themselves really were not complicated, I guess I just wasn't very observant! On one occasion I wasn't sure what it was I was supposed to be looking for. (Tip for others who are as clueless as I am--a "tree spigot" is that thing you tap into a tree to collect maple sap. Seeing as I live in maple tree country, once I realized this I felt like, "Duh.") I had to skip a couple of minigames as they were of the "Slide/move the tiles/items around until they're all in place" variety, where the movements of one item affect the movements/location of the others, and I'm horrible at such things; a couple of other minigames I "solved" merely by chance (i. e., clicking around cluelessly long enough). Most of the games are easy to figure out HOW to play, if you pay close enough attention to the surrounding hints. There was one minigame (early on, with the colored marbles in the rings) that jammed up and refused to work, a known bug in the game (see the tech issues forum), so I had to skip that one, but afterwards everything progressed smoothly. There is no walkthrough available for this game, either in the game or online, that I'm aware of, unfortunately. (Thus the tentativeness of my recall in this review--I can't check my recall against any walkthrough!) The game is mostly easy enough to not need one, in my experience. There's an in-game journal that collects pertinent information, but no map, and no bonus material, as there's no Collector's Edition. I can't recall if there were different game modes though I believe the game summary says there are two. (I always play the easy/casual or relaxed/untimed modes.) There doesn't seem to be a misclick penalty (at least, not in the easy mode), and minigames can be skipped. In the mode I played, the game "nags" you by showing a sparkle indicating the location you should head to--I didn't mind this as I'm the clueless type, but it could be annoying to those who want more of a challenge, so perhaps that's not present in the harder game mode. The hint system is kind of iffy even in easy mode, however; at one point, I hadn't completed a task in a certain location before I moved to another location, but I didn't get that nagging sparkle telling me to go back and finish the task, so I was briefly confused; clicking the hint button resulted in nothing useful, so I had to figure it out on my own. A plus and a minus I felt like mentioning: Plus: The dreamworld you enter in John's mind. Everyday locations are warped and twisted in a surreal manner, for example, Lucas's house is floating on a chunk of land in empty space. The most interesting location was the house interior, where doors are set in the floor, stairs in the ceiling, and everything is just wonky beyond measure. Minus: Along with the things already mentioned, the detail of the custodian(?) who hooks you up to the machine that puts you in John's mind was kind of a strange and random one. This man (whom I believe you first encounter outside the hospital, though when I met him I assumed he was a police officer!) seems to know about you and your circumstances, and I think he mentions he used to be a doctor (thus explaining his knowledge of the medical device he uses to access John's mind), but aside from that, his presence and knowledge of things--as well as why he's no longer a doctor--is never explained, and he vanishes from the plot after he hooks you up to the machine...very weird. Who was that guy? Why did I let him hook me up to that strange machine? o.o In any case, all in all, the game is decent as a standalone, but as a sequel to the first, it leaves something to be desired. I obtained my copy of "Echoes Of Sorrow II" on CD-ROM through an online retailer. The game folder takes up 749MB on my hard drive. I ran this game on Windows 7 with one known bug/error (the marble game, mentioned above) but no other problems. Step into a dream machine and piece together the events of a mysterious tragedy!